Will this ship to California? BEST ANSWER: No. California is communist. This can only ship to a free state. Are you positive of this? The only thing I can see that would be illegal here is the magazine, which would have to be restricted to ten rounds. YOU GO TO GULAG NOW! Now that’s just unfair! California is not Communist. It’s a Progressive Socialist Utopia! So no, you can’t have one. The rifle is legal because it is a rimfire not a centerfire rifle. The magizine is not legal but just don’t have them ship the magizine. does it have a flash suppressor on it? BEST ANSWER: Standard A2 birdcage flash hider. Is the barrel threaded? Is so what is the thread? BEST ANSWER: 1/2-28, same as M4 / AR15. How quickly is shipping ? BEST ANSWER: PSA takes a bit of time to get an item shipped (4-5 days) but they get it out there for a great price. Unbelievable !! Two days !! Is this just the rifle or the kit with sight and case? Mine came with red dot and case. What size discreet bag (overall length of upper kit) do i need for this? Is this legal for MD? BEST ANSWER: Gun, yes. Mag, no. Do you ship it directly to my house or to the FDL of my choice? BEST ANSWER: The rifle will need to ship to a current FFL licensee. Will this ship to Colorado? Is there a 15 round mag available for shipping to Colorado? With the new magazine law will this now ship to California? How are you handling the recent safety alert? And how is delivery impacted? 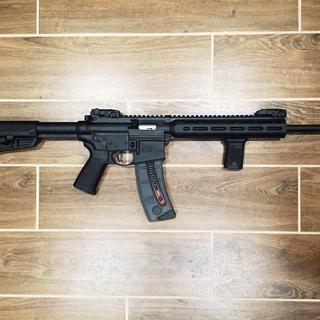 Is it possible to convert the upper to a 5.56 barrel/ complete upper to make the rifle into an ar15? Is this in stock to buy in the Greenville store? Can the lower frame be used with other calibers? 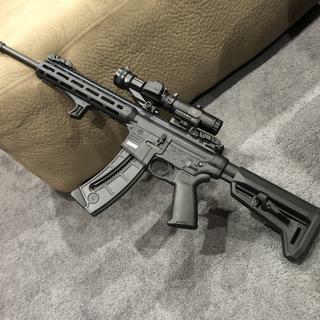 If I purchase the S/W AR15 22LR will I receive one that was manufacturer after Feb 2019, or before? How many magazines are included and does it come with any type of case? BEST ANSWER: Mine came with 25 round mag and case. Thank you for an educated answer. It comes with ONE mag. When all else fails, read the description above. Just the one you see in the pic. Are these weapons under recall as if 4-1? BEST ANSWER: Not that I know of. There's a safety alert. Look on S&W's site where you can check your SN to see if it's affected. They will send you a tool to check the bolt. Is the buffer tube mil-spec? I want to be able to put my Magpul stocks on it? BEST ANSWER: Yes it's mil-spec and Magpul will work. Where did you go to get the tan done to the stick and ect? Is the 15-22 Sport Comparable with a 22 Magnum shell or will it accept only 22LR? BEST ANSWER: Only shots 22LR not magnum. Does this include a magazine? BEST ANSWER: Yes. It comes with a standard 25 round capacity black magazine. Yes, this comes with one 25 rounds magazine. Yes it does. 1 magazine 25 rounds. Yes, one 25 round magazine. Yes, a 25 round mag. BEST ANSWER: New. Unused. In factory OEM box. How long is this rifle and how long of a case do I need 40” or smaller? BEST ANSWER: The S&W M&P Duty Series Gun Case fits perfectly l. It is 40” long. The rifle extends from 30.5” to 33.75”. Thanks , oddly enough it wasn’t in the description. It is 35" long. I have the PSA 36" rifle bag and it fits perfect. Can you remove the birdcage flash hider? BEST ANSWER: I believe so since it’s 16” and is legal length. But I haven’t tried. can i add a bottom rail? BEST ANSWER: Yes. There are m-lok slots on the bottom and both sides of the rail. I purchased the M lok style rails to add accessories. Yes, it does come with a small piece of m-lok rail. is the flash suppressor threaded at 1/2 28 ? BEST ANSWER: Yes. This gun is a blast to shoot suppressed if that’s why you’re asking. Why can't u put a different upper 0n it? BEST ANSWER: Although it looks like an AR-15 is is not exact. The first reason as it is a rim fire not a center fire. Second the mag well is designed for their mags not AR mags. Third the timing and springs in the lower are set for the recoil of a 22 round. One thing would be your mag well is different plus no buffer or spring. Can you ship this gun without a clip? BEST ANSWER: This gun uses a detachable box magazine not a "clip"
Ok can be shipped without a magazine. I live in a Maryland and want to purchase one of these. But we can only have a 10 load magazine. That's why I'm asking. Contact PSA customer service for help with this. Are you able to put a bi pod on this model? BEST ANSWER: Yes. Comes with a short picatinny rail than can be mounted on the underside of the foregrip and can have a bipod attached to that. I'm sure something will fit. I purchased this gun as an affordable practice substitute for my AR-15. I have it set up the same way. Red/Green dot sight, $18 Feyachi that co-witnesses well with the included MagPul sights, MagPul AFG2 Angled Fore Grip, and Geissele G2S trigger. You may wonder why put a $150+ trigger on a $300 gun. I wanted the same feel as my AR and I prefer 2 stage triggers. Very pleased with this rifle, sights are great and was dead on out of the box. Great price. Great fun. Easy to use. Unfortunately received just before safety recall. Can’t wait to get it back to the range. Rifle shoots great. No jams. Smooth firing. Lightweight and beautiful. Cheaper than I could find anywhere else. Best purchase! Fantastic gun. Great build quality. Fun to shoot. I’ve had zero issues with the many rounds I’ve shot already. Functions well with cheap ammo. Great for training. Fun to shoot accuracy is awesome. All my weapons are S&W. Shipping was fast. Thank you Palmmeto. Would order through them again! Great product! Love the gun. Service was swift also. It's a great little gun. Bought this gun primarily for the range and I absolutely love it. A lot of fun, super accurate, reliable, and being .22 I can do $0.75 mag dumps. Using either CCI or Federal Target Grade ammo I’ve not once had a fail to fire or fail to eject and have put about 1,500+ rounds through it already. If you’re thinking about getting this gun I would say go for it. No matter what your reason is this gun is great to have around. No issues what so ever with firing. Very accurate and fun to shoot. Great value and hours of affordable fun! Excellent rifle! Very reasonably priced with Magpul sights for $299. Tons of fun and performs exceptionally well. Highly recommend for fun and budget friendly training platform. Love it . And the price point is perfect. Great gun. Fast shipping, came just as advertised. Would purchase here again. Great gun. Shipped quick, showed up just as advertised. This is a great gun. I bought it for my daughter and put a red dot sight on it. It is very accurate and extremly fun to shoot. Great lookig rifle and everyone loves shooting it. Great rifle for the price. Can shoot all day for a few bucks. I rated this rifle 4 out of 5 stars. I replaced the factory charging handle, which is plastic, with an after market aluminum charging handle. Love the sights this rifle comes with. Saw this rifle as a daily deal and the price was awesome! As always, fast shipping from PSA. I've shot around 350 rounds without any malfunctions. 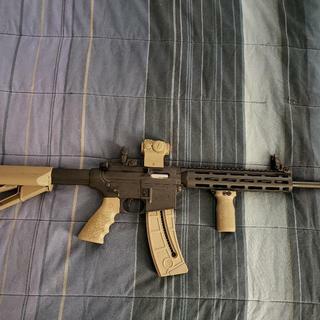 Added a Magpul STR stock and Magpul MVG verticle grip, Hogue pistol grip, Holosun HS503GU all in FDE. One of my favorite .22 rifles. This rifle is very accurate and reliable! Shoots thunderbolts, Winchester bulk pack hp, Federal bulk pack hp. Shot about 1000 rounds so far. Only gripe the bolt hold open on last shot only works about half the time. 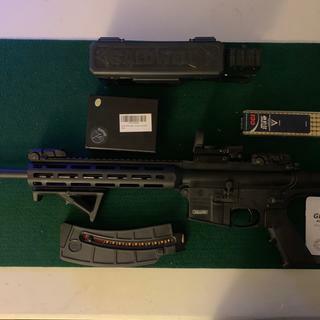 Gun was shipped to FFL without problem, took to the range following day. No problem with the cheap Walmart ammo. Very happy with this gun and recommending this to everyone. This thing really is unmatched for reliability and eats all ammo given. Recently received this 22. 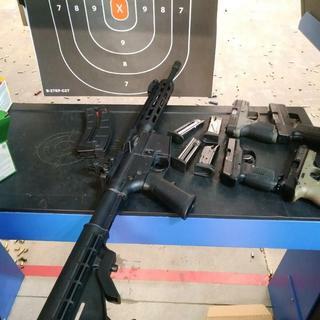 Went out to the range to try it out. Was greatly impressed with the lightness of this rifle compared to others I've shot previously. The recoil is minimal which makes for easy site recovery. The peep sites were a nice touch. Definitely recommend. Sweet shooter, accurate and great price. Love this gun. Already ran 500 rounds thru it with out any problem. Easy to get sighted-in and it is now a tack driver. Must have for anyone that loves to shoot, especially for the cost. Very satisfied with my new rifle. The price is right and seems to very accurate. Awesome gun, use it to train. Ammo a lot cheaper that 5.56. I use this to try out accessories before I put them on my AR. No issues, fires great. Great service, well pleased with the rifle. If you’re on the market for a effective rifle this is it. Right out the box it was spot on. Very satisfied with it. I truly did not have much expectations when I bought this gun. I am used to buying guns that are 10 and 20 times this price. SIG MCX, FN, etc. I decided to try something different for a change. and bought this AR style 22 Cal. The first thing I noticed was that the trigger was good but not great. I was turned on to Rock River 3.5 pound trigger SKU#: AR0093NMKV for $80 . I also added the Romeo 5 Red dot for $120 available at PSA. The results blew me away. At 50 meters, I am putting rounds in about 4 centimeter diameter, no kidding, sometimes less. I use only CCI MiniMag and I have shot over 1100 rounds now without 1 single failure whatsoever . This gun is the best value on the market and my first S&W gun. Added a case and 3 more Magazines. It is truly a pleasure to shoot, a precise gun (at 25 meters, 2 centimeter diameter), very quiet of course, ammo very inexpensive. I don't shoot animals, but I love to target shoot. I stressed the heck out of this gun on Sunday (yesterday) by shooting 600 rounds continuously. Not a single problem or deviation. The standard deviation stayed the same. For the record, I was shooting sitting down from a bench. The only bit of a negative is the spring for the charging handle is a bit week. but oiling it fixed the issue. Shot it 1200 rounds without a single cleaning and not 1 problem, just dropped 1 oil drop on the charging handle. For $300, this is the best value in 22 LR. And best of all, this is a true AR class taking AR parts. So you can drop in a trigger (took me 10 minutes by the way to change it and I am no expert - just followed the instructions).You can spend $2000 or more for an Anschutz to get 1 additional millimeter of precision and a beautiful gun - yes you can. But the Anschutz is a Bolt action unlike this which you can press the trigger fast and stay on target. Definitely a BEST BUY! Cheap fun in an anything but cheap firearm! This gun is almost too much fun to be allowed to own. I bought 500 rounds of long rifle .22 ammo for $14.00 and shot it all in under 3 hours. Went back and got 1500 more. If l had been shooting .223, it would have cost about $150.00 for the same number of shots. Buying a Primary Arms .22 lr scope in March. Can hardly wait! 1500 rounds no probs. Work hourse!!!! 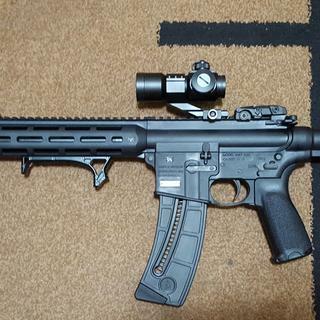 Awesome Rifle! A Must Have! Great training rifle, just fun to shoot! This is just a fun gun to shoot. Great for someone that is just starting with rifles as it is very light and easy to use. Not to mention that the cost of shooting is very low. For a semi-auto in a AR platform, it is hard to beat. Love the gun... a great time at the range. My shell extractor did break around 600 rds. Even though S&W would warranty it I decided to just fix it myself sence it so easy and cheap . Plus I wouldn't have to deal with the hassle of sending it in and waiting and getting it shipped back to my FFL. Put a Volquartsen extract in for under $16. 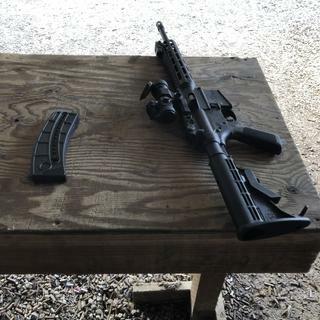 Great service here from Palmetto State Armory and this rifle doesn’t disappoint! I wanna buy another one I like it so much!